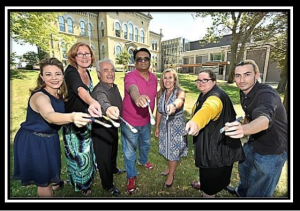 Brampton….Downtown Brampton’s cultural scene will be painting the downtown on canvas as artists from across Ontario will be competing in the first annual LIVE ART COMPETITION Saturday September 10, 2016. Monika Moravan – PAMA & James Flux – Beaux Arts. “Yes, Live Art is coming to Brampton’s downtown! ….Our arts community is yet again bringing another brilliant event to the community on Saturday September 10th! Exudes, Grettel Comas, organizer of Live Art Competition. Through the vision of John Cutruzzola, a local Brampton artist, artists will be painting and competing for first, second and third prize cash awards. Guests 18 years or older are invited to take part in the competition. Beginning at 9 a.m. and running till 5 p.m. Pre-registration cost: $25 , Registration on the day of: $30. One 16” x 20” canvas will be provided to each artist, artists are to bring their own equipment and materials. Closing ceremony begins at 4 p.m. in Daily Times Square. LIVE ART COMPETITION is presented by Inzola’s Art Endowment Funds at PAMA in partnership with Downtown Brampton BIA and sponsored in part by Beaux Arts, PAMA, and The City of Brampton Arts & Culture.